I'm starting to realize that jam has a definite place in farm life. Last year, I froze our few excess berries as-is, and while they were tasty once thawed, they weren't phenomenal. 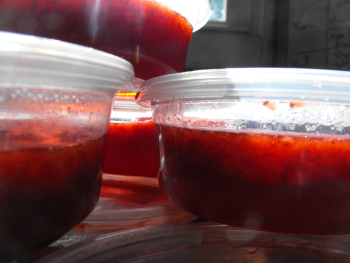 Then Mark's mom gave us some homemade strawberry freezer jam. Wow-whee! We thinned that jam down and mixed it into salad as dressing, ate it in gobs on pancakes, and even spread it on cakes as frosting.